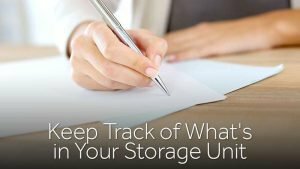 Keeping track of your possessions when you move or store them requires a good plan. Anyone who has moved or stored more than once knows the value of taking the time to categorize/number boxes and create lists of their contents. When it comes time to locate items in your storage unit or unpack a household, you’ll thank yourself for the effort. Experienced movers fine-tune their organization system over time, but for first-timers, here are a few tips to help you out. Organization requires a list. If you like your electronics and have a laptop or tablet, you can carry it from room to room as you pack. 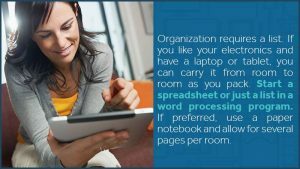 Start a spreadsheet or just a list in a word processing program. If preferred, use a paper notebook and allow for several pages per room. Attach your pen or pencil with a string to the notebook so you never have to backtrack looking for it — they’re easy to lose in the chaos of moving! Also, have several jumbo-sized marker pens on hand for easy-to-read labeling of the boxes. Think of your categories first. If you’re moving to another home, create a list first by rooms, then by box number, then by individual items. You’ll have the kitchen, living room, master bedroom, garage, etc. Write these on the boxes with big marker pens. Because the boxes will be stacked every which way, be sure to mark on all vertical sides and on the lid. It may seem too much work, but you’ll never have to pull a box and turn it until you find the labels, which will save you a lot of time and self-recrimination later. Before you start packing items in a box, label it by room and give it a unique, sequential number. Write the number down on the corresponding room page in your notebook or add it to the column in your spreadsheet. As you fill the box, mark down everything as it goes in. For privacy and security, you should not mark each item on the exterior of the box. The criminal-minded passerby may take note as you load your transport and take advantage while you aren’t watching. There are good and bad ways to pack your storage unit. Our best advice is to pack heavier boxes on the bottom, and lighter ones with fragile items on the top. This method ensures that your stacks are stable and aren’t going to go tipping over at the slightest pressure. We wouldn’t want your stuff to break! Another great way to keep things stabilized is to pack like-size boxes on top of each other. Keep things snug in the storage container by building walls or tiers within the container. The more tightly packed everything is, the less likely your stuff is to shift around while in transit, which reduces furniture joint loosening/damage and keeps your boxes in their neat stacks. You can further protect any furniture in your container by draping blankets over them. Oh, and please don’t pack any hazardous materials! Remember, if you use a paper tracking system, keep it with you and not in the storage unit. When you need to find an item, simply refer to your list and locate the correct numbered box. If you need to store your goods for a brief time while you sell your house and move, you should consider using portable storage rather than the typical facility with acres of garages. Zippy Shell of Greater Columbus can reduce the amount of work involved during a move. Who doesn’t want a hard project made much easier? With Zippy Shell, we bring a portable, street legal storage unit of the appropriate size to you. After you load it, we’ll come pick it up and hold it in a very secure, temperature-controlled warehouse for as long as needed. Then, once you’re ready, we’ll deliver it to your new location where you unpack it. This takes one episode of unloading and reloading a truck out of the equation when you rent a garage-style storage unit. Since only approved and authorized persons have access to the warehouse, your possessions remain protected at all times. With the help of these tips and Zippy Shell of Greater Columbus, your move can go smoothly. Contact us today for a free consultation.